Outside Hankyu Men’s Department Store, Right by the bus stop across from JTB tourist information center. Meet your guide and group in the early evening in front of Outside Hankyu Men’s Department Store, located off the Yamanote Line at the Ginza stop exit. You’ll spend the next 3 hours eating and drinking your way through some of the city’s top eateries for locals, an aspect of Tokyo few tourists ever get to experience. 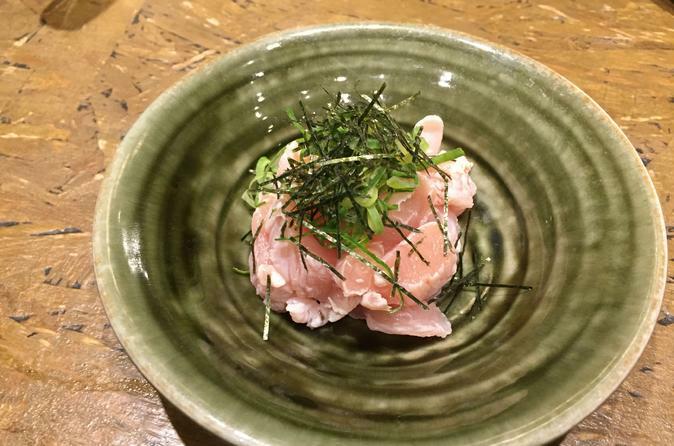 Stop by Gado Shita, a busy restaurant area located directly under the city’s elevated train tracks. Wander amidst the narrow streets, blazing neon sights, and enticing smells of this culinary hot spot, an area which hearkens back to Japan in the 1970s. You’ll stop by a selection of local ‘izakayas’ (pubs) frequented by residents, where you’ll try out 5 different varieties of ‘yakitori’ and 2 drinks. Head next to Tokyo’s upscale Ginza neighborhood, an area which provides the perfect contrast to the labyrinths of Gado Shita. Marvel at the upscale food shops selling $500 designer melons and let your mouth water as you pass by meticulously-decorated pastries in the display cases of local retailers. 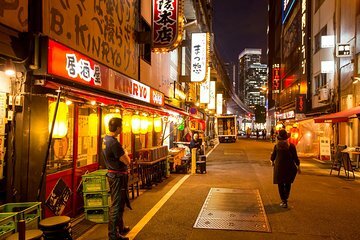 Finish your food exploration by visiting Shimbashi, where you’ll get a chance to take a deeper dive into some of Tokyo’s many rustic eateries and charming ‘izakayas.’ You’ll finish your excursion at Shimbashi Station. Minimum drinking age is 20 years. We had a really nice time during this tour with our guide Bryan. The total experience was really fun. Even though not everyone loved ALL the dishes that were in the tour, it didn't matter, because every dish had its own story and each location that we visited was special. There were vegan and vegetartian and pescatarian options. I can highly recommend this tour. The food tour of 3 neighborhoods sounded so fun! 18-20 tastings is what was listed and we got around 12-15 if you include the miso paste and sauces to add on the food. For the price, around $300/couple, the amount nor quality of food was not commensurate. If it would have been in the $50/pp price range would have made more sense. The tour guide was fantastic, though not as knowledgeable when it came to recommendations on things to do and places to eat in Tokyo. After the tour we were still very hungry and had to find a real dinner. Yuko and her assistant were very helpful and thoughtful tour guides. We ate yummy food and learned a lot about Japanese culture. As an FYI- if you do not eat pork, this is probably not the best tour for you. Fantastic tour! Highly recommend taking this. We enjoyed walking through the various areas, learning about the history of the city and of course the food. The size of the tour was just right. And we enjoyed the food so much we went to a few of the places on the days after our tour. Our tour guide Ryan made this an excellent tour. His knowledge and personality, combined with the selection of restaurants we visited made one of the most memorable tours during our visit to Japan. We got so much out of this tour! If it's on your to eat list, you'll probably have at least a small portion on this tour. So much food, and then a full meal at the end! We learned so much all along the way. Asami - Thank you for being a wonderful guide. Outstanding fun with great guide. Really pushes you outside your normal cuisine! Fantastic time.